Oh Lord. I gave a talk in New York last week about blogging and Twitter and I was making the point that being controversial isn't always a bad thing. 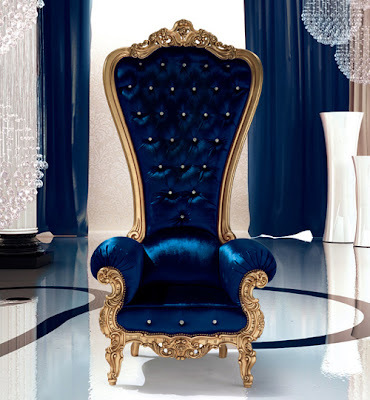 Someone asked how to do that without offending a potential client or vendor and I responded that she should look for Italian furniture developed for the Russian market. I hate to play to national stereotypes, but some of them fit. Almost to make my point for me, Italian manufacturer Caspani just released a collection of chairs they're calling the Regal Armchair Throne. Do any of these things actually sell? Who would have such a thing in his or her home? Again, I hate to play to national stereotypes but I'm going to pretend I'm German and just go with it. DirectTV's Gregor should have one of these. "Italian furniture developed for the Russian market" - the most apt description ever. And I can't imagine there isn't at least a hint of self-awareness on their part. If there's even a hint of self-awareness I can't find it. I don’t know, man. I guess the question to ask is, do you have to sell your soul to sell? I personally think people do want to buy products, but what they most want is solid information on a product they’re interested in, not just another hype job. And if Madison Avenue could refrain from beating us to death with commercials every single moment of the day in every possible venue, they might well learn that less is more. Some time back I read that these geniuses were seriously contemplating installing advertising cards above urinals in public restrooms! I'll take two of the thrones and one of the giraffes, please. Hold the tittering. 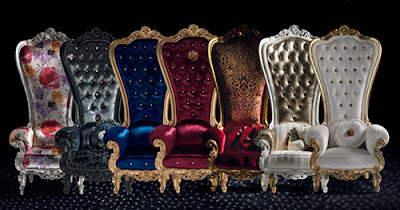 These are so ridiculously over the top, that it's hard to imagine any residential application, unless it'd be taking the rose print one(far left) and putting it in a little girl's Alice in Wonderland room for 2 yrs until she decides she'd like a (still more horrific) Justin Bieber room. Joseph: as someone who's spent more than a little time on Madison Avenue, ad people only do what they do because it works. Nancie: I'd kill for one of those giraffes too. I'll leave you to the thrones. Lax: because that rose fabric looks so shiny, I think it's actually rose printed velour. Somehow, that makes it better. I wonder if they make a coordinated miniature giraffe bed. Oh that's right, giraffes can lie down. Think that's true of the mini variety too? These chairs look like Pee-Wee's playhouse restaged by Tim Burton. I never got the Tim Burton thing until LAX brought up Alice in Wonderland. 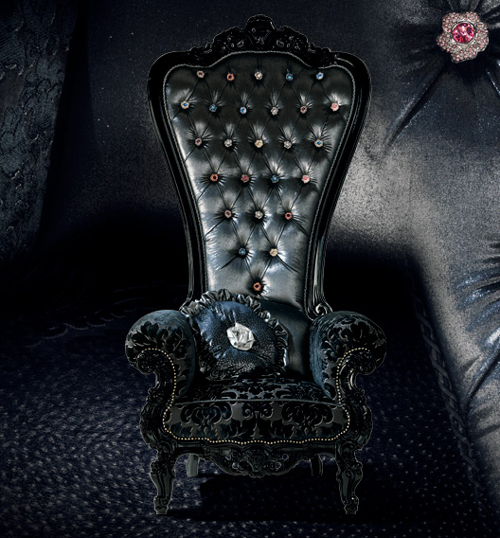 These chairs really are something out of a Burton fantasy.